Today’s post will be the start of a new segment of the Timeout at the Plate series. It will branch off into the pro-edition and what better way to start it off then with a professional writer. In a Timeout exclusive, Rockies MLB beat writer Thomas Harding lent his time and energy into helping the readers and myself find out more about this man. I’m sure Rockies fans alike can appreciate the dedication and time one man puts into his craft and the finished product that is Harding’s Rockies coverage. job. Celebrating his 46th birthday recently, covering the Rockies in Tucson, Arizona, he is a man who knows this team and the dedication it takes. Almost 10 years covering them, countless miles travelling and hours in the press box, you can be sure if you ask him a Rockies question you are going to get a solid answer. I wanted to look beyond the box score and into the experience of MLB’s man with the plan for the Rockies. Living in suburban Denver, does writing in a press box in the Arizona desert or countless other stadiums, seem like a job? Harding has made it known he likes to field questions about the team and did so through the (now defunct) Mailbag (soon to be) “Inbox” on ColoradoRockies.com. 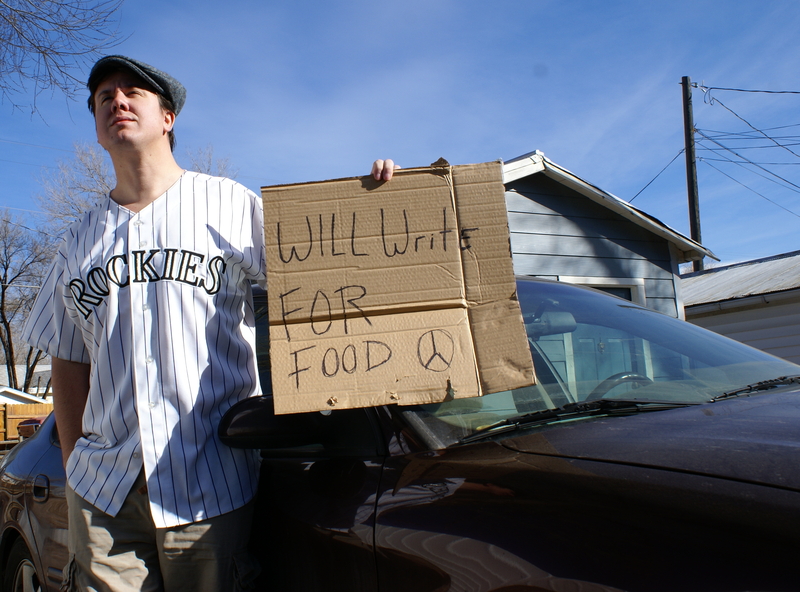 What makes the man want to take questions on his blog Hardball In the Rockies? Or coming from a guy like me who hates predictions in sports, I had to ask if he had one for the Rockies in ’09. Would he answer? Mr. Harding, let me take a moment to thank you for taking time from your busy schedule to be part of the Timeout at the Plate series. Let’s talk a little about you first. How did you get your start in writing for the Rockies? I was working in Memphis, Tenn., covering various sports, but wanted to cover a major league team. I thought it would be football, but an opportunity came up at The Gazette in Colorado Springs. MLB.com came along at the right time, when The Gazette was pulling back on its coverage of pro teams in Denver. You’ve covered every stage of baseball from Single-A to the Majors. What has been the biggest difference? The biggest difference is the confidence the players have in their ability. Any minor leaguer believes he can play, but he truly doesn’t know until he reaches the highest level. Heading into 10 years covering the Rockies, does it ever feel like a “job”? It certainly can, especially when it involves time away from the family or when plans during offseason days are trumped by news. But the truth is I don’t have to work in an office, I am involved in sports and I write. I knew all along I wanted to write at some point, so I have a good situation. As a reporter you have seen the progression of media shift from print to internet to phone, PDA, blogging etc. Do you see a time when a blogger such as myself with a journalism background (or without) is granted some form of access to the team or will it be organization based access for a long time to come? The business is changing so rapidly that it’s hard to predict anything. I am confident that in order for blogs to continue to grow, there has to be some way for original information to emerge. Usually, the accredited media have the access and the bloggers can illuminate. But with fewer newspapers covering clubs, fewer reporters cover and, therefore, there are fewer chances for information that can come directly from players, the coaches and the manager. I don’t see the players and coaching staff talking directly with fans via daily or regular chats, or personal Web sites. They would see that as a distraction to Job 1. So will bloggers be given credentials? That would be tough, since teams and leagues need clear rules so everyone can’t claim the right for access. That would create crowding issues within the clubhouse and press box. Also, when a traditional media outlet is issued a credential, there is a reasonable expectation of the purpose of that credential. The beauty of blogs is they can go in any direction, but some of those directions do not fit with traditional coverage. I could see that being a problem to those in uniform. Sitting as a fan in the seats I love taking my pop to the game or a friend or loved one and enjoying the experience with them. Is it ever hard sitting in the press box and taking care of business but maybe missing out on that interaction as a fan? I’ve been involved in covering sports in some way, shape or form my entire adult life, so I don’t necessarily miss it. You kind of learn. My one concession is I follow the Pittsburgh Penguins, especially during the playoffs. So I get my fan fix that way. Okay, let’s move to the Rockies guru side of Thomas Harding. In my interaction with you and the writings from your own blog, Hardball in the Rockies, I have gotten the sense you are very much open to taking questions on the Rockies from the fan base on your blog and formerly the Mailbag on Rockies.com. I’m guessing some reporters might have neither the time nor the desire to do that. What makes you different or happy about doing so? I think you’ll be seeing more and more reporters realizing such interaction is important. I don’t feel like I have so much expertise that I can write from an ivory tower or talk down to people. Many of the questions I get from fans turn into stories. And I’m happy to say, the old Mailbag is returning under a new, state-of-the-art name, the Inbox. As I am writing this, you are in Tucson and the news from spring training has been a mixed bag at best for the Rockies. Injuries to Jeff Francis and Taylor Buchholz are setbacks but bright spots like Ubaldo Jimenez and Todd Helton feeling better give the fans hope. What do you feel will be the greatest obstacle the Rockies face this season? The biggest concern I would have is the early schedule. April is heavy with road games. There are two series with the D-backs at Chase Field and one with the Dodgers at Dodger Stadium. Injuries happen. But, remember, in 2007, the Rockies lost three-fifths of their starting pitching staff in July and August. I personally hate predictions because they are rarely right. Without predicting a number, does your gut tell you the Rockies will finish better than .500 this year? If you want go out on a limb here and give me your gut feeling on the reaching the playoffs too. I hate predictions as much as you, so I’ll just deal in expectations. If .500 is a goal, it’s a low one. I remember going into the 2007 season, I said many times that if the Rockies weren’t competing for a playoff spot in September, fans had a right to be bitterly disappointed. This year, I’d take that to a new level: if the Rockies don’t make the playoffs, I believe the season is a substandard one. Finally, I have written much on the idea that Todd Helton will be the first Rockies player to reach the Hall of Fame. Would you, with your vast knowledge of the club, agree with this idea or do you see another player doing it first? At this point, I doubt Helton makes the Hall of Fame, mainly because of the injuries he’s faced over the last several years. There would have to be a return to past numbers and past power, and he’ll have to stay healthy. That means a career as a star into his 40s. I’m not saying it’s impossible, but it’s a tall order. Thanks for everyone stopping in to check out the “Pro-edition” of Timeout at the Plate. There will still be interviews with other great MLBloggers to come in the regular edition, so keep checking back. For fans who do not have a blog, or would just like to ask Thomas Harding Rockies questions at his blog or the upcoming “Inbox”, it requires a simple registration at MLB.com. After the registration, users can comment on a variety of great blogs or other baseball forums at the website. If anything, stop by Hardball In the Rockies and give him some love. “It breaks your heart. It is designed to break your heart. The game begins in the spring, when everything else begins again, and it blossoms in the summer, filling the afternoons and evenings, and then as soon as the chill rains come, it stops and leaves you to face the fall alone.” Bart Giamatti. Baseball has seen most of the major strife this country has faced and through out, it has taken on one form or another and supported the masses. Whether during the ’30s and depression era ball bringing the first night games to be played or the ’40s with brave women taking over and creating “a league of their own” as brave soldiers fought in WWII. Even recently as 2001, poetically, the Yankees took to the field after 911 versus the Diamondbacks to reassure Americans we would go on. It was an American tale to see the D’backs face the “giant” and win in the World Series but it was the American dream. You could do anything. The year of 2008 saw the first black president and great strides in tolerance but also the culmination of corruption in American business. Thousands continued to lose their homes and life savings and red and blue were still the colors separating American and American. With great reserve and fear so many Americans will turn to the national pastime this next year on radios, internet, television and if lucky enough, visiting so many of the holy shrines we call stadiums. That’s where I come in. I will assume majority of people who are reading this don’t know me, so I will give a brief synopsis of where I am coming from and what will drive me there. Roughly six years ago I gave up my passion in writing for fear of student loans and other obligations I couldn’t pay. I took another job that would meet those obligations but I lost my dream along the way. How many people out there have done the same? 2008 gave me the opportunity to once again realize that dream and at what better time to begin to realize the opportunity before me. Much of it started with prompting from my mother. Gotta love moms. I had gone to the DNC in Denver with a great friend and I wanted to see the spectacle that was American politics. I wanted to see through the eyes of a journalist something that hadn’t been in Denver for a century. What could I learn or be a part of? I marched in an anti-war protest that was the largest of the DNC with over 12,000 people not because I didn’t support the troops or love this country and understand their sacrifice, but because I wanted to highlight the idea of peace and maybe if just given a try we could be a better world. In comes my mother. After hearing of this she reminded me that I used to write and maybe I should write again. So I did and a local southern Colorado paper ran my piece. Not long after it was attacked in an editorial by a gentleman who I don’t believe meant harm, but called my idea of peace “flowery rhetoric.” I was saddened not because he had disagreed, but because I felt this was probably the feeling of so many Americans in this day and age. I then asked myself what I could do to change this. I firmly believe one person can make a difference in this world with the passion and determination to do so. Along came the idea for Baseball Across America. I am currently in the process of becoming homeless. Not because of foreclosure, but because I won’t need a home where I’m going. Majority of my possessions are being sold or will be sold and the rest will go into storage or donated to charity. February 1st , I will officially be without an address of my own for the first time ever. I am taking the last money I have in savings and putting it all towards living my dream and hopefully making America and the world a better place at the same time. How? At the beginning of the baseball season I will follow behind my team, the Colorado Rockies, and as best I can go where they go. Not in first class plane trips or by fancy means but in my 2001 Ford Taurus with 140,000 miles on it. I won’t be able to see every game or go to every city and truthfully I don’t know how far I will even get on the money I have. I may take a flight or two if I find I can afford it, however American engineering and the Taurus will have to hold up! But it’s the journey I’m going to write on. The experiment. The experiment will have me staying with complete strangers and family or friends when available. My goal is to document not only the game of baseball but the great people of this country in each and every city and home I am welcomed into. The humanity of the great people of this country is what I hope to see most. No arguments or divisions or separation by race, income or belief. I love baseball and hope to act as an ambassador of my love for the game. You the people are welcome to come along but not just passively. I hope that if any post I write inspires you to do good then please by all means. A call to action. If something I said in the back of your mind prompts you to a kind deed then every last penny of my life savings was worth it. We can all do this one deed, one person, one city at a time. We all are in this country and it’s the best one in the world so why not try and make it just a little better for everyone. For a moment look at the We not the I. For those outside America the principle still holds true. Canadian brothers in baseball or Mexican brothers begin the fight. Most who know me would say I am stubborn and not quick to ask for help. For this journey I have put that stubbornness aside and will ask help of so many people, so many towns to visit and homes to take refuge. Anyone wanting to help and even if in kind words can always email me at baseballacrossamerica@gmail.com or stop in at rockymountainway.mlblogs.com. My internet access after February will depend on coverage where I am but I will do my best to respond to every email I get. I’m not naïve in the challenges and obstacles I face. I know there will be many who disagree with me and would rather see me fail. I know the money will eventually run out and the car could quit in the middle of nowhere. I could get robbed or in an accident and terrible things “could” happen. I’ll paraphrase Bob Marley here “the people trying to make the world a worse place aren’t taking a day off, so how can I.” The things I hope to happen are worth far more then the negative that could come about. Some will say driving and seeing baseball games is not hard but I’ve driven many road trips and it is hard. Writing everyday will be a job and trying to cover America no easy task. A great quote I read recently from a freelance writer said something to the effect of being a freelance writer you are free to starve wherever you want. I hope not to starve but losing some weight would be a good thing! I won’t say that every post at http://rockymountainway.mlblogs.com will be Pulitzer Prize winning material. Some will be very light hearted and some serious. But my hope through all the bad is to show the good that does not make the daily news. Sure if I find a to die for brat with onions and peppers in Houston or an awesome baseball statue in San Diego you will read about it. If I come across an amazing charity in Chicago or unbelievable youth baseball program in New York I will highlight them. I understand my blog is a baseball blog and baseball will be this ship carrying me to my destinations. I can’t thank the people at MLBlogs enough for giving the opportunity to ordinary people to write. Thank you Mark and all the others that go into keeping the sight up and running. Mr. Rodgers said it best “would you be my neighbor.” In 2009 will you be my neighbor in rediscovering the beauty that is America through her people and places and her past time? Again you are all invited to help and read along in this chapter of my life. January will find me packing and cleaning and maybe even finding a part-time job to pay off some more bills before I go. February will find me franticly trying to pay those bills still! I’ve been invited to stay on a friends couch until I leave and it will also find me gearing up for my journey. March will find me beginning that journey and God only knows the outcome. I am not perfect and have made too many mistakes in this life to count but it’s what we do now and in the future that determines who we are. Every minute is an opportunity to do the right thing even if it’s the hardest thing. No matter your age or background we all take steps backwards at times but as long as you’re trying to take steps forward it will all work out. God bless each and every one of yours in 2009 and I hope to meet many of you on the road this year and maybe tell your story!